Midwest Irish Focus, the monthly Irish newspaper by Pete Maher that focuses primarily on Irish-Americans in Missouri, Kansas, Nebraska, Iowa, Minnesota, Illinois, Arkansas and Oklahoma, now has an online presence - in the form of MySpace. It has only been running for a week but already the blog is in operation with valuable pieces of information - like the availablility of back issues, and the presence of the subscription form being in the photos section. This is a good move for the newspaper as there really is no good reason for every single business, organization, and event, not to have a social media presence. Irish KC has been on MySpace for a year now - but I’ve been hiding because I’m not actually that sociable and in a pre-emptive mood don’t want any new friends before they show me that they’re not really friends, though I do like the idea that online I can now ignore more people than I could ever ignore in the flesh. Scowl. If you read Midwest Irish Focus you will frequently see a column by myself, called Celtic Comment which is written under a variety of names as I continue my stereotypical Irish life on the run. Here’s a feature The X ran on Midwest Irish Focus in their 2005 St Patricks’ Day edition. This entry was posted on Tuesday, February 13th, 2007 at 12:24 am and is filed under Midwest Irish Focus, blogs. You can follow responses via my RSS 2.0 feed. Both comments and pings are currently closed. Many thanks for the tip o’ the hat. Stop by from time to time, I expect I’ll get better at posting even more nonsense on MySpace as time goes on. Pete we had someone from Lincoln NE contact us about coming in as Irish dancers for our fest. She said she found out about it from your paper. What did you write about us? Please send me the article if possible and thanks for what you did for us. Pete I forgot to give you our website it’s http://www.greeleyirishfestival.com Hope your readers can make it. It’s going to be a great fest!!!!!!!!!! 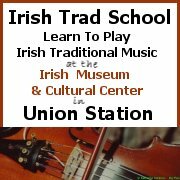 I am looking for some suggestions regarding a Celtic Band to perform a concert after our planned St Patrick’s Day Parade. How can I contact you to talk about this? You can contact me at the paper via e-mail at Irish_Focus@att.net.